If'n the freeway were capped between Church, Tryon, College, and South/Caldwell, those townhouses would become an instant hit, and turn to for sale properties as they would overlook a park, and have incredible skyline views. The ensuing park would be our "Central Park" and immediately create huge opportunities for expansive growth along Morehead. Seattle’s experience with Alaska way (and the Embarcadero in SF 30 years before that) shows us that the traffic really does just disappear and chaos does not ensue. There is absolutely no reason to think Charlotte would be any different. We are also in a position to combine freeway removal with the provision of new transit (The Silver / West line) parallel to the road. This is a once in a generation opportunity. When the Independence / Brookshire interchange gets reconfigured you could build a massive parking deck to accommodate the prisoners of internal combustion. Parkers could then be whisked to their offices on either the Silver, Gold or Green (new Belk transit route) lines. Problem is. Many if not all of those townhouses at South Blvd and Morehead would be below grade so they’d be demolished. My very crude graphic showing what Belk removal might allow (most of the 277 space would become a linear park). Given existing ROW the new transit route on the removed road would probably be cheaper than a cap. Yeah, I was thinking of this the other day. All of the office workers at LU trying to use Church St to get to SouthEnd is going to be a nightmare. This is the only new Silver Line alignment that makes sense to be more than two blocks off The Square. Brookshire is already a direct link to expressways east (74) and west (16) of Uptown. Plus, a freight line (CSX RR) would still be a north of Uptown. Replacing (or even keeping but following) Belk hits both Uptown employment and newer development areas. If Silver Line can't share Blue Line or even Gold Line through Uptown, then follow Belk, not Brookshire. Seattle’s experience with Alaska way (and the Embarcadero in SF 20 years before that) shows us that the traffic really does just disappear and chaos does not ensue. There is absolutely no reason to think Charlotte would be any different. I do agree with the need for expressway connectivity to Independence, just via the much more direct Brookshire, especially given its continuity between US 74 and NC 16. The viaduct carried about 91,000 vehicles per day (roughly 10,000 more than the Belk) and it appears that a month after closure about 30,000 of those vehicles have simply vanished (meaning they are using other roads, some drivers carpooled, some took transit, some just stopped making the trip). I suspect many more of them would have disappeared if the replacement tunnel did not exist. the Seattle freeway was an elevated viaduct correct? that is what I remember from years ago. that is not the same as a freeway like I-277. This is not going anywhere soon unless all trucks and cars go away. Yup, Alaskan way was a viaduct (and it wasn't seismically stable so it needed to come down). Other than its instability, what about its elevation makes it functionally different than the Belk? The Belk, unlike Alaskan way, uses up a ton of pretty valuable real estate -- there is lots of value to unlock there. While I agree that freeway removal of any kind is Charlotte is extraordinarily unlikely, what makes you confident that the Belk "is not going anywhere." What makes it more worthy of preservation than a pre-diet East blvd or Scaleybark? 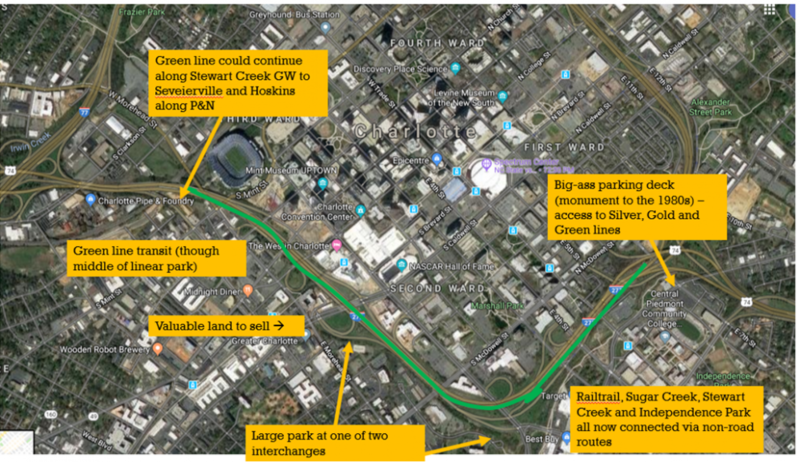 I suspect that a comprehensive cost-benefit analysis would reveal that Charlotte would be better off converting the Belk to greener uses (parks, transit, development...). All I am saying is that CDOT should do that analysis. I just think accessibility would be ruined if you take away this urban loop. With uptown gaining 1000s of workers and residents and not a fully built out transit system eliminating the freeway loop would choke uptown and cause the growth to go elsewhere or even to other cities. Trucks still need to get to uptown for deliveries and so do residents. Plus the NC DOT is not going to tear up a road just not going to happen until cars and trucks are extinct and that is not going to happen in the near future. Plus there is so much vacant land uptown now that is not even developed aka the First Ward, 2nd Ward is underdeveloped as well. The state has invested 100s of millions into making Independence an expressway and this urban loop is needed to feed that. I realize many people think cars and trucks will disappear soon I don't buy that at least for the next 20 plus years. Lets talk about it again in 2050. I just think accessibility would be ruined if you take away this urban loop. With uptown gaining 1000s of workers and residents and not a fully built out transit system eliminating the freeway loop would choke uptown and caus﻿e the growth to go elsewhere or even to other cities. Trucks still need to get to uptown for deliveries and so do residents. Plus the NC DOT is not g﻿oing to tear up a road just not going to happen until cars and trucks are extinct and that is not going to happen in the near future. Plus there is so much vacant lan﻿d uptown now that is not even developed aka the First Ward, 2nd Ward is underdeveloped as well. The state has invested 100s of millions into making I﻿ndependence an expressway and this urban loop is needed to feed that. I realize many people think cars and trucks will disappear soon I don't buy that at least for the next 20 plus years. Lets talk about it again in 2050. I certainly don't think cars and trucks are ever going to go away, but there is a great deal of reason to think their use may decline as drivers are forced to pay the true cost of consuming fossil fuels and asphalt. Realistically, Charlotte doesn't have any transit plans that deal with the projected growth of the city. The only hope the city has is to make the core as dense as possible. Getting rid of 277 would mean that the "Uptown Ballentyne" style of offices gets built in actual Ballentyne or ,even worse, the River District. And creating sprawl isn't going to help your chart. There are not many alternates for getting into town that would absorb the capacity of 277. The traffic in Charlotte isn't bad AT ALL. I think it could easily be absorbed without most of 277. The far western portions of 277 ( and northern portion) could remain to Independance, and I don't think the eastern and southern portions are necessary. The only hope the city has is to make the core as dense as possible. Getting rid of 277 would mean that the "Uptown Ballentyne" style of offices gets built in actual Ballentyne or ,even worse, the River District. But its not certain it would play out this way. In fact the evidence from freeway removal elsewhere is that densities around the removed road increase. Purposefully making a transportation network less efficient in my opinion is never ever a good idea, and that’s exactly what razing any part of I-277 would do. Even if carmaggeddon did not occur-in the sense that one would not casually observe a difference in overall traffic levels- the traffic the 80k+ cars/day that was carried on the interstate would be shifted to the surface street grid by necessity. As a result cars that previously were able to pass around uptown without stopping would be subject to painfully slow stop and go traffic on the street grid. This would create greater carbon emissions and an increase in the potential for motorist-pedestrian incidents. Given that one of the most consistent complaints by UPers is the danger posed to pedestrians in Uptown by Charlotte drivers, it is ironic to argue that it would be better for the tens of thousands of cars that I-277 carries to be redistributed onto the streets in Uptown. Now one might argue that the ROW could serve as a viaduct for transit and pedestrian/bike paths but I don’t believe it is a stretch to say that we would be lucky if such a project would reduce the number of VMTs in and around Uptown by 20%. And it would do nothing to alleviate truck traffic. Furthermore, there is no need to raze 277 for development purposes. Pretty much every neighborhood in or near 277 is growing like crazy right now, especially the areas that straddle the John Belk segment of the freeway. P.S. The biggest source of global carbon pollution is, by far China and not US freeways. Another large source of carbon pollution is the ocean shipping industry largely due to the proliferation of cheap goods from China. 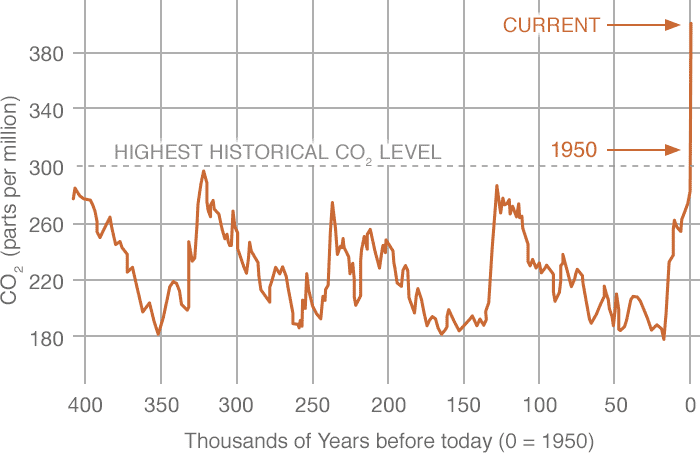 The two of these together account for 30%-35% of global carbon emissions. If you want to reduce the global carbon footprint, a better idea than closing down freeways (which may be counterproductive) is to minimize the purchase of goods produced in countries such as China where the environment is nothing more than a sink in which to bury the true cost of production. Tell all your friends to do the same. So we are supposed to just keep going about our days in cars and act like it isn't a major producer of carbon emissions just because you are so used to driving down the freeway to your job? 277 is one of the biggest deterrents to pedestrians between uptown and the surrounding neighborhoods, its essentially a dead zone. It makes walking uptown miserable. Are we supposed to create a headache for the millions of motorists and disrupt the flow of billions of dollars of commerce that use the freeway all so you can enjoy a moderately better pedestrian environment? Every time I go through that area, there is no shortage of pedestrians either on the South End or Uptown sides of 277, so maybe you don’t like it but it doesn’t seem to be a headache to most. And even if it is a minor nuisance to pedestrians is it worth it to spend tens of even hundreds of millions of dollars raze the freeway and do what is necessary to bring it up to grade in the name of creating a pedestrian utopia? It is after all in a trench, so just putting up barriers and closing it off to traffic will not create an environment conducive to the pedestrian heaven people want. In order to create that environment you would have to destroy all the overpasses fill in the trench with hundreds of thousands or millions of cubic yards of fill material, and then you would have to rebuild the street grid. All told you are looking at a hefty price tag for this, and that money will have to come from somewhere- most likely transportation funds that could be used to build more infrastructure rather than destroying it. Or perhaps it would come from a bond issuance since the impetus of such a project is livability as opposed to transportation needs, but then it would be competing with real needs like affordable housing...all in the name of pedestrian utopia. Then there’s the inconvenient fact that cars that once used the freeway would now be forced to use at grade streets to navigate around Uptown. Given that roughly 80k vehicles use the John Belk on a daily basis, you’d have to assume that tens of thousands of vehicles that once used the freeway would now be a direct danger to pedestrians in and around Uptown streets because they would be sharing that space as opposed to being routed around it. And I suspect that NCDOT and CDOT would probably want to create even more high speed one-way pairs to mitigate the additional traffic, which is, with the exception of a drunk driver utilizing the sidewalk as if it were a road, possibly the worst thing for pedestrian safety that exists. So in a twist of irony, the very thing you clamor for-the removal of a freeway in order to make a better environment for pedestrians- may end up making the pedestrian environment worse. So we are supposed to just keep going about our days in cars and act like it isn't a major producer of carbon emissions just because you are so used to driving down the freeway to your job? This is also VERY short sighted in how the auto manufacturing industry is moving - all electric. Within 15-20 years the vast majority of commercial and personal vehicles will be all electric, with hybrids accounting for another portion of the remaining "older models." That will have more of an impact on vehicle carbon emissions than removal of freeways/push towards mass transit. Don't get me wrong, I am all for mass transit and better urban connectivity for non-vehicle modes of transportation. But the car is not going away any time in our lifetimes. I think there are certainly options that keep the freeway intact and still provide the ancillary need for connectivity, i.e. a freeway cap. But to use automotive carbon emissions, which have actually been in a decline in the U.S. since 2005 due to better fuel economy, as a major sticking point to remove freeways is not a valid argument. Another point is that if you removed a freeway and say a half of all those cars disappeared, by moving the other half to a grid system you would either be at a net zero difference in emissions or possibly increase that amount due to the inefficiency of city stop and go traffic. There's a reason why the average car gets around 8-10 mpg better fuel economy on the freeway vs. city driving. There is a faction within the urbanist community that demonizes cars. Just look at some title's on this forum "Pedestrian Shaming", etc. The folks that subscribe to that faction's views will use anything to paint cars as the main source of all Urban problems. For the past two decades (or so) they've hijacked the climate movement to push their own agenda. Things like commerce or facts - like transition to EV's is well under way don't seem to phase them. That folks that subscribe to that faction's views will use anything to paint cars as the main source of all Urban problems. For the past two decades (or so) they've hijacked the climate movement to push their own agenda. Well I do think any community over reliant on the automobile is a major problem for urban environments. For one, it fosters suburban sprawl. And an auto-centric environment has more negatives than positives when it comes to urban development, to me at least. My ideal utopia would be a highly dense urban core that relies on people movers and mass transit with no personal vehicles allowed within that core. But I'm also a realist. The auto industry - through slightly nefarious means such as purchasing streetcar companies/grids solely to close them for the benefit of auto sales - has changed the landscape of how our current urban model works. And that's not going to change any time soon. So, in my eyes, it's how do we incorporate those two models of urban living (car-centric vs. mass transit) to make a cohesive environment that benefits both the economic sector that is the driving force behind dense urban cores and the need for sustainable residential/public spaces. Nobody here has said we need to eliminate cars. But I think we would all (most) agree that drivers should pay the true cost of their mode choice (and yes, emissions are a declining portion of that but transportation is still the US's single largest source of carbon). If we ignore the fact that the land under the Belk is an asset that _might_ have more productive uses then we are not managing our community assets appropriately. Here in 'bankerville' that should be an unforgivable sin. How about the land "above" Belk? Isn't that the same land? And by that measure that means any freeway running through/near an urban core in any major city is not a valid use of that land. On contrary, I think the need for proper connectivity to the core and Independence Blvd. via freeway is an appropriate management of assets. Also, if we're to make this argument of land management, there's still swaths of undeveloped or redevelopment land within 277 that I think takes much more precedence than the land currently used by the freeway. First Ward/North Tryon in particular.